I’m always on the lookout for tools that CityGrid publishers can use alongside the web and mobile apps they’ve built using CityGrid Places and Advertising APIs. Today I came across a cool WordPress plugin over at WP Mayor, a site for WordPress news, articles, hacks and plugin reviews, that turns your local blog into an iPhone enabled city guide, called Placeling. To get started, Placeling provides an iPhone app that allows you to mark places that you’ve been, which will provide the reference for blog posts that you write later. Next you install and activate the Placeling plugin in your Worpress site. You’ll notice that now, when you write a blog post you’ll see a marketer next to the upload photo button, and a new box called “Placeling” below the main editor. The first time you do this, you’ll be asked to login to Placeling, which will give you access to the places that you’ve marked using the Placeling iPhone application. No you have access to all the places you’ve been, linking them to the blog posts your writing on the places and things you’ve seen. Each blog that is linked up to your Placeling places will be available via the Placeling iPhone app for other people, showing a summary you provide and a link to your blog post. The WordPress plugin automatically appends the Placeling logo to the footer of your blog post, giving credit to Placeling and completing the local places blogging network they are working to build. I think Placeling is a creative approach to linking up local content to places, in a very hyperlocal way. It shows a lot of promise if you can come up with ways to incentivize local bloggers to link their content to the network, and potentially monetize with places that pay and advertising. 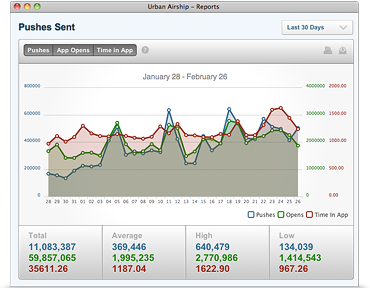 Urban Airship came out with some new push notification tools this week, including services that allow you to slice-and-dice your mobile application audiences by location, time, context and preference–allowing you to improve the relevancy and targeting of messages and offers. The mobile back-end as a service platform Parse has emerged out of beta and is ready for prime time. Over 10,000 developers on the platform. The SDK is installed on tens of millions of devices. 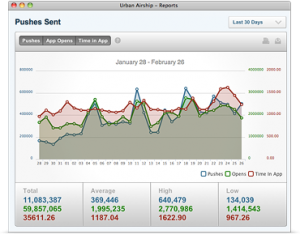 The platform serves hundreds of millions of API requests per month. The platform sends tens of millions of push notifications per month. The company is up to 13 full time employees now. Most of the numbers above are growing at 40% each month. You can visit their pricing page for more information, where they also have an enterprise plan. Parse has also updated their SDK to version 1.0, there is more details of this release on their site.